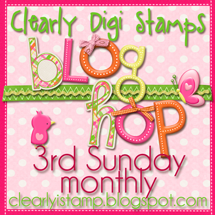 Welcome to the Clearly Digital Sunday Blog Hop! These blog hops are the third Sunday of every month....a must see for a lazy Sunday afternoon! There will be a prize each month! There was a great response to the way we changed things up last month with the prize, so we are keeping that change! Each DT member is showcasing a digital image, and you could win that image! There will be a winner from each participating DT member's blog. WINNER: The winners will be randomly chosen from comments received on DT member blogs. The winners will be announced on the CDS blog Thursday, March 21st. Thanks for a fun bloghop! Woo Hoo I get to hop! How Fun!! What a fun hop with lots of ideas from the DT! Guess I should spring clean and see what I can use up too. Thanks! Loved the hop!! Really cute images & cards from all the DT members! Wonderful blog hop ladies, but I knew it would anyway! Lol. You ladies always do amazing cards and I am so happy that I got to see some old and new sets today. Hugs. I love Blog hops. thanks for having this one. Wonderful hop!! I really enjoyed all the creations by the DT!! Thanks for the inspiration!! March Digi Day at CDS! 10% off your entire order through March 14th!